Keywee boosts your online sales, branded content, and audience development initiatives by unlocking audience insights and infusing them into every step of the storytelling process. Making stories relevant and powerful. Keywee works with 400+ of the world’s top storytellers. Keywee uses natural-language processing to scan your content and understand what it is about. Keywee employs its vast database of historical performance to target audiences that have been shown to act on content like yours. Keywee automatically generates numerous variations of paid posts, with optimized bids for each selected audience. Keywee provides insight into how your paid posts are performing with your targeted audiences, across platforms. 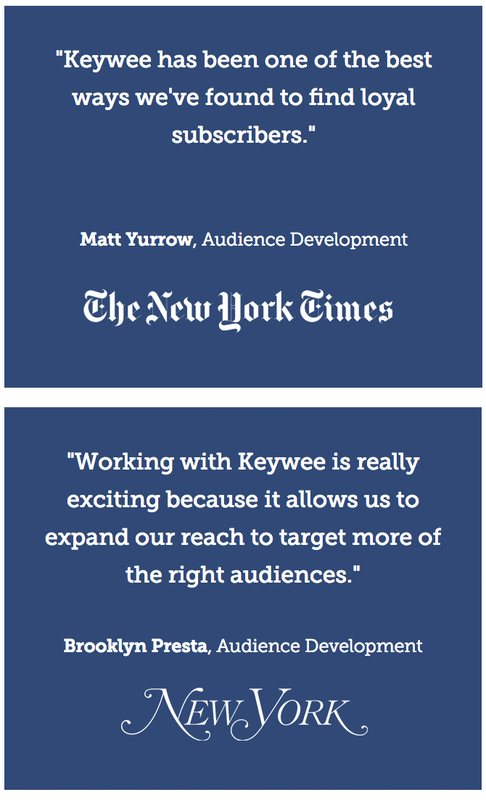 Keywee uses insights from your paid content distribution to inform new content ideation and creation. "Keywee has been one of the best ways we've found to find loyal subscribers." "Working with Keywee is really exciting because it allows us to expand our reach to target more of the right audiences."